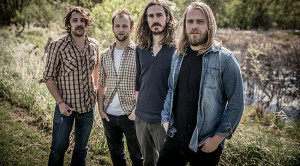 The Bros. Landreth, a Canadian roots rock group that features siblings Joey and David Landreth, holed up in a straw-bale house last year in the dead of winter to record their new album Let It Lie. Somehow they overcame the elements to deliver an album that’s rightly drawn comparisons to the Eagles, The Allman Brothers and Jackson Browne. The album includes “I Am the Fool,” a song originally written by their father, renowned Winnipeg musician Wally Landreth. The brothers’ dad even stopped by the studio to sing a verse on “Runaway Train.” Bassist David Landreth recently phoned from a Kentucky tour stop to talk about the album and the current tour. Is this your first venture to the States? This is the first one with any sort of fanfare or real push behind it. I would call the first ones exploratory runs. We played Buffalo the night before last. We played this super funky room right downtown at Ani DiFranco headquarters. We played a listening room in the basement. How exactly did this band come together? Joey and I were both out on tour with other bands. We were making a living as sidemen. We were both at the end of pretty challenging tours and we were both feeling burned out. He said we should start something just for fun. He wanted us to do it in between other gigs as a creative release. We wrote some songs and we figured we might have some mojo there. It took over and now it is the main gig. Everything else happens between this. That was about two years ago and we started recording in January of 2013. It wasn’t that long ago. You recorded Let it Lie in a straw-bale house. What was that experience like? It was amazing. It was super exciting. We were finally making our own music. We had been in the studio with other bands but it was a fresh experience to be at the helm instead of taking orders. The actual studio is a thing to behold. It’s in the middle of the sticks. It was an incredibly cold winter and we caught a really bad cold snap. It was a hibernating experience. We holed up in this place. It was inhumanly cold outside. We just tried to make some warm music. Murray Pulver produced the album. What did he bring to the project? Maturity and class. He’s a refined gentlemen. His production style is quite subtle. He wanted to cut the fat on a lot of the tunes. It was a real subtle massage to everything. Is it a breakup album? Yeah, probably. I think that’s safe to say. Joey brought almost all the songs to the table. Some of it was cheeky. Some of it was really profound. There’s one song that’s not about a breakup and not about a lousy boyfriend . . . but just one. “Our Love” is a killer track. What inspired it? Joey started writing that song almost ten years ago. It took him almost ten years to write. That’s just love slipping away and trying to come to terms with it. The record is covered in keyboards. That song is like our Black Crowes tune. I guess that would be an example of Murray’s not so subtle production techniques. We’ve taken it through every permutation. You could joke and say it’s like a bossa nova mid-tempo jazz song. We worked it over before settling on how we play it now. It suggests the band might be louder in the live setting. People say they love the record and want to hear it live. We try to play the songs the way we play them on the record, but we’re players and we take great joy exploring the songs musically. We wouldn’t be satisfied to just run them down night after night. Sections start to pop and you work in a moment and find a new harmony. For us, it’s a slow drift. What’s it like for a Canadian band to play Americana? We don’t tend to call it Americana in Canada. We don’t call it Canadiana either. We tend to refer to it as roots music. There’s lots of roots bands. We come by it pretty honestly. It’s the music we grew up on. Were both your parents musicians? Our dad was a touring musician. It’s s similar story. He was a sideman in a lot of bands and recorded his own album in 1991, so it’s safe to say that we followed in his footsteps in that respect. Mom was an incredibly musical person. She played some piano and sang and had a great music collection. Not everyone grows up listening to Bonnie Raitt and John Hiatt. It was normal for us. What are your hopes and aspirations for the album? We hope to get the record out to as many willing listeners as we can. We get a kick out of finding people who really appreciate the stories and appreciate what we have to offer. Whether they come to it because they like the music or the lyrics is fine. We want to play for folks and spread some joy through music. It’s going to be a big year for us. We managed to connect with some real fantastic people who are strong champions and believe in what we’re doing and we’ll hit the road early in 2015 and spend lots of time in the States. It’s hard enough for anyone to make it in the States, even if you’re from there. There are other challenges and complications that come if you’re from north of the border. We’ll take it in stride and give it our best shot.